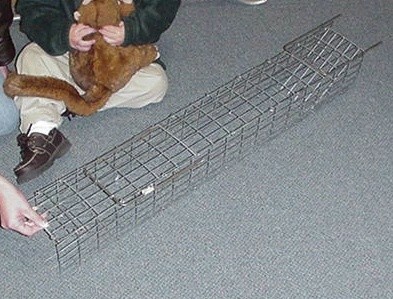 PRODUCT DESCRIPTION: Cage type trap which is placed in muskrat runs. Animals enter but cannot get out. Generally will kill trapped animals, particularly if the set is under water. However, it is possible to catch them alive if you find a run in shallow water and are able to make the set where less than half of the trap is under the water line. WHERE TO USE IT: In their (Muskrat) runs which are usually in small feeder streams, rivers or along shore lines of ponds and lakes. RATE OF APPLICATION: Where runs are present. How does it work? Do you have a larger picture? If you look to the right of the picture, you'll note the door is "down". But it can move freely since its on a hinge. And it can only be pushed in and "up" when outside the trap. 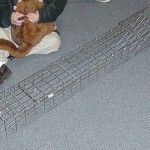 So as muskrats approach the trap, they'll push the door up which will allow them to enter and the door will close behind them as they move through the trap. On the left side of the picture you'll see a person's hand is holding the door "up" to show how it moves. Now once set in a muskrat runway, both doors will actually be closed by default. But as a muskrat enters from one side, the door will close behind them and they'll be trapped since they cannot push the door open again.